When you see “my colleagues” as title, it means that the resources shown are filtered: Twproject shows you the resources that belong to the same company as you do. It is not by default showing all resources you can see, as this may be a large selection. In order to change what is shown, click on “refine search”. Why two buttons? Because Twproject manages both users and companies. Person can log-in (if login enabled), companies cannot. A company can contain several other companies and users. For instance a “company” can have several “department” each with several “offices” and finally every office could contain several “person”. You can create your organization charts in detail using companies, departments and person. Both person and company can be “assigned” to a project. In order to create a resource you must have permission to do so, so to keep it easy for the moment we’ll assume that you are a super powered “administrator” (which is the default after setup). The form allows specifying all main data for a person as name (or first name), surname (or last name), e-mail addresses etc. that are common in a basic directory management. If you think this is enough just press save and your first resource will be created. Only the surname field is mandatory. The code field is not mandatory and it is not unique. Each mandatory field is prefixed by *. You cannot save a form without filling each mandatory field, in case you try to do so, the field will be enhanced as shown: and the action stopped. 1) this means that “Erika Sunk” is part of the “International Geographic” company. This is how Twproject constitutes an organigram, as a tree. 2) Twproject can record more than one personal data. In this box you will see the list of locations. by specifying the manager you will keep track of resources’ hierarchy. “Total working hours per day” is an important value, as it will determine the load of the user w.r.t. to task and issues assigned. You can print or get a vCard file (vCard is a standard format for contact exchange) of your resource. It’s probably easy to guess the meaning of the other fields. Notice only the “area” combo that allows setting your resource’ security environment. For the moment we are setting up a simple mono-area environment. Notice the R#22# which is a resource unique code that allows to link to it from any text in Twproject . The other buttons will be active once saved. For your resources you can specify work hours per day. In work settings tab you can insert start time, end time and break. This data will be considered by the operator load to calculate resource load. To enable Saturday and Sundays you have to enable them for the entire installation in the administration page and the you have to turn it off to those not working in the week end. Using Twproject you can add and then manage every resource involved in your projects. You can decide to use resource management lightly or in depth by specifying less or more data. 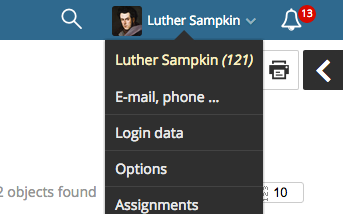 If you decide to use it in depth, Twproject will also keep your contact list, or even your organizational charts . Basically a resource is defined by its name and that’s it, but if you want the resource to be operating in Twproject, you have at least to define a login name (and a password). Let’s see how to create a new resource by using the “resource editor”. If you define a login name and a password, the generic resource becomes a Twproject’ user and then can login and operate in Twproject. You may assign resources to projects and issues even if they don’t have a login. A user can be hidden (administrators only can see it) and/or disabled (cannot login anymore). When a user is disabled all data inserted or related to the user is preserved. You can re-enable disabled users when needed. In the highlighted box above you can choose one or more “global roles”. In the first usage “easy mode” you should check “Operational” on every user you create; this is a role created by default during installation, that provides the minimal set of permissions required to operate comfortably; or you could even more roughly set every user as “administrator” and bypass security in the beginning. You can define as many global roles as you need but if you want to use the Twproject’ security in deep, see Security. If you have a special security policy regarding password length or expiration times, see Twproject security. If you want to use your LDAP/ Active directory to import/authenticate user see LDAP/Active Directory. Passwords are not recoverable from the database, so there is no way to recover a forgotten password; eventually, just reset it. Disabled users are not counted in the license total; so if you have 10 active users and 50 disabled ones (e.g. : temporary employees for specific projects than do not currently work with you), you only need a 10 user license. Every user can customize her/his Twproject experience by setting image, interface language, her default home page, default color of notes from myself, etc. Some of this data is relevant for Twproject’s management and we will meet it again later. If you are surprised that there are both English and American as language options, this is because in addition to the interface language with this you set the default format for dates, which are different in these two countries. The meaning of the page “subscriptions” will be clearer later when we will talk about assignments, but for the moment, just remember that Twproject has an event based subscription engine, so you can be subscribed to listen to a specific event. For example, if you are “subscribed” to a task via e-mail, and the task gets closed, you get a notification e-mail. In this page all your subscriptions are listed. You can also remove subscriptions and all of them with the “remove all subscriptions” button. Companies and departments are both created using the “create company” button setting then a different resource type. You can create a company with many departments and each department can contain as many resources (resources that can be persons or companies or departments); by structuring your company you get your organization chart and some other nice features, like workgroups, that will be described in the following. 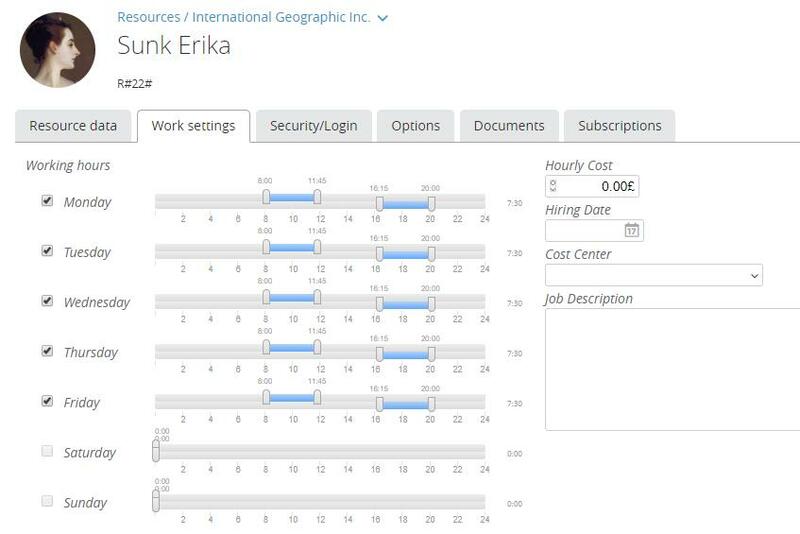 The form is similar to the “person” one, and on the sidebar you get the list of connected resources, list that contains both persons and departments. where X is the code or the ID of the resource.